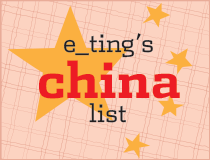 I'm now keeping this list updated on the e_ting in Hong Kong page - check there! 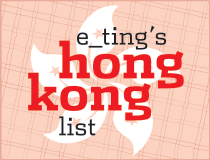 If you've ever called/emailed/tweeted me about where to eat in Hong Kong, here's more or less the list you would've seen. I've copied and pasted it here, with a little more detail added. I'll try to update as often as possible/relevant. Note that I've tried to keep my notes short to keep it an easy to read 'list', but if you want more details, just ask. Links will take you to addresses either in Openrice, one of my previous posts, or to my Facebook photos (usually with notes of some sort). (And I haven't had time to link everything, so please do a search on Openrice). To reiterate: this is a work in progress. Am I an idiot for having left something out? Tell me - comment away! Ming Court - Langham Hotel Mongkok - dim sum & dinner are both good, a personal all-time fave. There has been much debate in my family and among foodie friends recently about Ming Court. I haven't been back in a while, and I've heard nothing but mediocre to bad things about it. Boo. Lei Garden - several branches, apparently Wanchai is best (I've never been). Elements and TST (Tsim Sha Tsui) East branches are quite good. IFC branch is also popular. Avoid Kowloon Bay branch. If you want soup (a Cantonese slow-cooked affair that yields a subtly-flavoured consomme-like broth - not for everyone, but is an elixir to many who grew up with it), you must reserve ahead when calling to book, and don't go too late or everything will be sold out. Tak Lung - very old school, very out of the way (not far, but just totally off track, in San Po Kong). If you don't have time to go so far out or aren't fully ready for working class HK environs, go to Manor for similar old-school cuisine. Jade Garden - owned by the Maxim's group, it's a slightly finer version of what you'd get at Maxim's City Hall (which is notoriously difficult to get into and not that great, but a decent, 'tame' pushcart experience with nice big windows and a view... ish). However, I can only recommend the outlet at Star House, quality at others are inconsistent. Yin Yang - Margaret Xu's now-famous locavore act. Only a few tables (considered a private kitchen, but not anymore in my books - it's ground level and open to walk-ins at lunch if you're lucky). The food isn't pinnacle but it's interesting and worth a shot if you have time. Maybe try lunch. Book way ahead for dinner. San Xi Lou - Central/Mid-levels - mala (numbingly hot) hot pot and trad Sichuan dishes, don't order from non-Sichuan menu. Recently re-opened is Man Jiang Hong in TST. I'm not sure if these are the same people who opened the previous MJHs, and hence San Xi Lou above, but the food at MJH is just as good. environment is slightly rowdier than SXL. Also highly recommended by others are Yunyan - TST - and Sijie (private kitchen) - Wanchai. Da Ping Huo is for people who want atmos. One of the owners comes out and sings opera at the end. The food is majorly toned down, but apparently you can request 'real' spice levels. T'ang Court - Langham Hotel TST - fancy, pricey, Michelin 2*. Best at dinner, don't miss the whole crispy skin chicken. L'Atelier de Joel Robuchon - JR needs no introduction, but I must say that his Salon de The downstairs does one of the best sandwich deals in town - $43. If you're heading to Macau too and can only fit 1 Robuchon in, go for lunch at the one in Macau. Agnes b le pain grille - relatively cheap and cheerful. very decent food - something that never ceases to amaze me because if there's a city where this fashion-food thing could go terribly wrong, it's Hong Kong. Desserts are hit/miss, cakes are ok. Le Blanc - Wanchai - private kitchen, decent dinners for $300-ish, byo as many bottles as you like! Sister restaurant Le Marron is in Causeway Bay, but I've had better food at Le Blanc. Tuscany by H - Lan Kwai Fong, Central - It's the only place Harlan Goldstein (previously of Harlan's etc.) owns and cooks at now, but it's pricey for what it is (comfort Italian with occasional contemp flourish). Fish soup and choc fondant are musts. Being in LKF means it can get rowdy outside the resto. Update: Sad, but true. Tuscany has closed, and Harlan is moving on to a restaurant called Gold (ugh, classy) in LKF Tower opposite. Otto e Mezzo Bombana - expensive but good, esp pasta and that ribeye for two. Mandarin Grill - a classic. Some say it's changed for the worse since molecular influences by Exec Chef Uwe Opocensky came on board. Won Pung Won - one of many little Korean-owned and run restaurant in TST, but I like that their food is fresh and not over-sauced, and that they have everything from BBQ to shabu-shabu (sorry I don't know what the Korean name for it is - the servers here call it that too!) to standard, hearty dishes like galbi jim. Kaya - Russell st, Causeway Bay - BBQ. Myeongdong Express - looks like a student canteen, and probably is, given its relative proximity to the Polytechnic University. Cheap and cheerful. Sushi Sase - top of my "high end Japanese" list, I've not been yet, but have only heard good things. Kusuya Rakuen - izakaya/sake bar. Very casual Okinawan fare, large awamori and sake selection. The bar is the reason I go - it's probably my favourite place to sit in the whole of Hong Kong. Serious. I've never put it on the blog because they're packed as hell already and to make matters worse, have recently shortened their opening hours (1am weekdays, midnight Sat - go figure). Boo. Tai Ping Koon - east-meets-west, kitschy 1950s style. This was considered 'western' food to HKers in the 40's. They're most famous for their chicken wings poached in sweet soy sauce and huge souffles. several branches, I like the ones on Pak Sha Rd, Causeway Bay, and Granville Rd, TST. Decor at Granville is more interesting - timewarp 50s deco. Zoe in Causeway Bay - very light, subtly-flavoured, French-ish style cakes. Mandarin Oriental Cake shop (not Landmark Mandarin) - you can also sit in now. Gobstopping sugar art on show; great cakes, pastries and bread; rose petal jam makes a great souvenir. Simply Life at ifc - BAD coffee, but a great place to sit for brunch/lunch - pretty much the same view as Isola and four seasons lobby, but at 1/2 the price! Vero - local chocolate makers with small cafe, out of the way in Wanchai near the Convention Centre. They also have a shop at the Landmark (Central) now, much easier to get to but no seats. Xiao Tian Gu - Hokkaido milk puddings!! Coffee Assembly - Elgin St. One of HK's first boutique roasters, though I think their roasts (in general) lack a bit of depth. Crema - one of HK's first 'real' coffee places, but due to hidden/inconvenient location in TST East, lack of PR and coffee knowledge of the public, has never had as much great press as the likes of Fuel. They only use 1 blend. Epoch - Star Street closed as of Nov 2011. No idea what happened! Xen - specialises in siphon coffee, a bit out of the way in Quarry Bay (bad rhyme unintentional). Le Monde d'Ulysse - Gage St, Central - foie gras & duck confit to take home (like a traiteur in countryside France) or eat in. Cafe Gray Deluxe - beautiful, soigne setting, though I find food to be inconsistent. Good for dessert and a civilised drink. Lily & Bloom - design spot for comfort food menu, but mostly it's the style scene. Lan Fong Yuen - junky (but SO tasty) instant noodles with pan-fried chicken, also famed for HK-style milk tea. Whatever weird stuff they do with chicken thigh, I love. For Kee - (old: Part I / Part II [n.b. Part I links to an old, short round-up, in which I say the Sheung Wan ain't worth the good rep it's got for good, cheap food. Okay, so SW's not the best, but I take the "not so great" comment back. I've now grown to love SW, especially For Kee - evident in Part II, in which I call For Kee a "gem". Sheesh, inconsistent bloggers.]) For Kee shouldn't really go under the CCT section, but then again, they do a great milk tea. Their claim to fame is pork chop - it's simply marinated in soy sauce, sugar etc., home style, and pan-fried. Have it on rice, soup noodles or soup macaroni, with choi sum (vegetables), eggs, tomato (and/or - you're the boss!). After about 2pm, they also do pork chop burgers (chop, tomato and mayo - I usually tell them not to put mayo in - personal pref). Sing Heung Yuen - macaroni in tinned tomato soup and beef omelet? Yep. It's not for everyone. Australia Dairy (see Old School, above) does macaroni in clear soup with processed ham. It's a HK thing. Ball Kee -'Western' fried rice and other fried rice and noodles. Excellent 'wok hei' (breath of the wok). In a tiny alley, woks right next to you, barking waiters, brilliant. Tai Cheong - shortcrust egg tarts. Also try their 'donuts' - "sa yoong"
Gai daan zai - I don't really like street food at the stalls on street corners in HK, except for this waffle thing that has protruding oval/egg shapes instead of the standard square/checks. Called 'gai daan zai' and it's a dying art - they just don't make them like they used to. but there are a couple of places that are decent (do check the comments too for more suggestions from more gai daan zai lovers!). The Chairman is one of the places I would love to go to asap... I need to start planning. Many thanks for this impressive list. I will draw on it on my next visit. Awesome list! Definitely going to look for gabli jjim next time!! Very nice list! 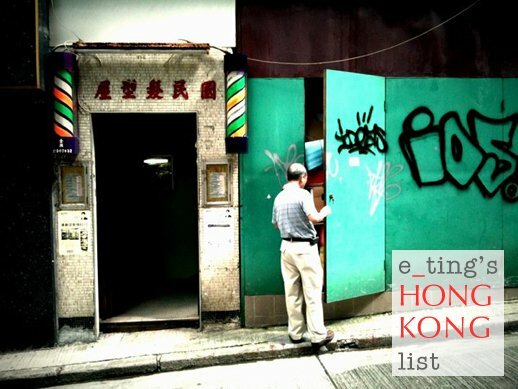 I might head down to Hong Kong to try some of these places.